This quarter I’m returning to a tissue that we’ve already seen. 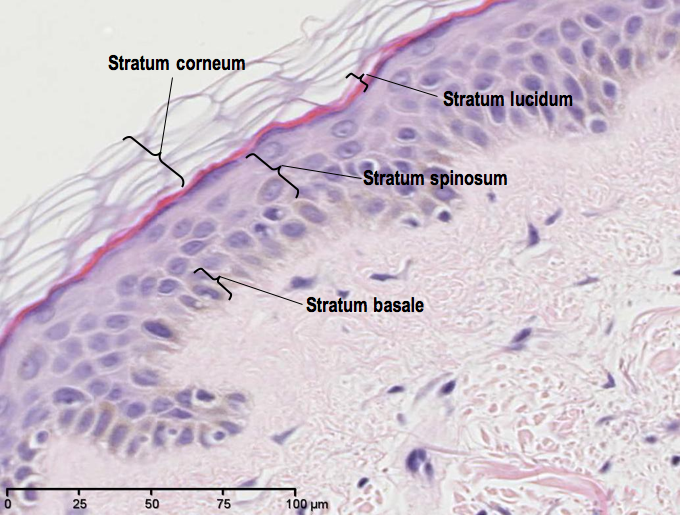 The very first issue of HistoQuarterly detailed the microscopic features of our largest organ, the skin. This issue, however, takes a look at a type of skin cancer, the superficial spreading malignant melanoma (SSMM). There are a number of types of melanoma of the skin but SSMM is the most common, accounting for around 70% of all diagnosed melanomas. 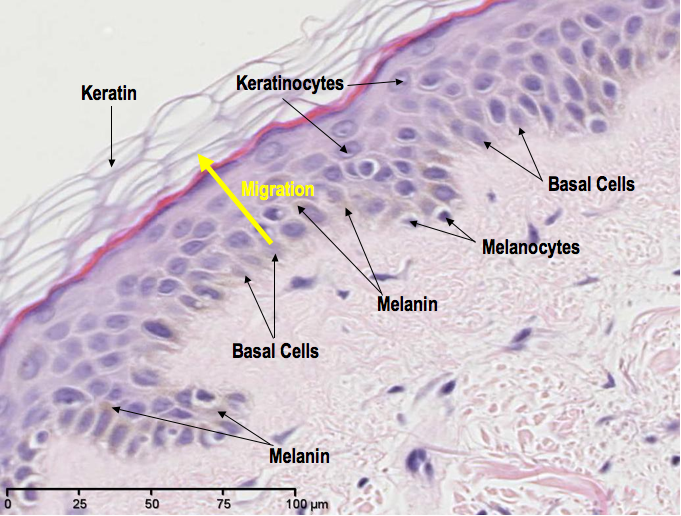 The melanin, or pigment, in our skin is produced by cells called melanocytes. The function of this pigment is to provide protection from the damaging effects of UV light (the majority of which comes from our closest star, the Sun). So, generally, the more pigmented your skin is, the more protection you have from UV rays. The fairer your skin, the less protected you are. When skin becomes sunburned, this is evidence of failed protection from UV rays, which is also a high risk factor for skin cancer. A malignant melanoma is a cancer that arises from the melanocytes – the same cells that, ironically, function to protect us from the very rays that can turn them malignant. Now, when we are considering the diagnosis of SSMM, the name “superficial spreading” can be a little misleading. 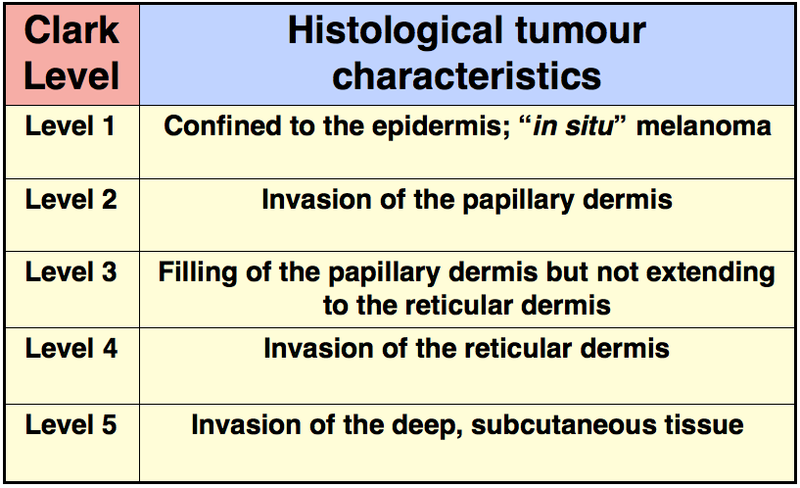 “Superficial” seems to imply that the tumour spread remains confined to the upper layer of the skin (the epidermis), but just like any melanoma that is neglected, SSMM also has the potential to invade the deeper tissue, thus making “superficial” a bit of a misnomer. in the epidermis – malignant melanocytes huddling together to form loosely rounded structures called “nests”. singular melanocytes migrating upwards through the epidermis – a pattern known as a “pagetoid spread”. 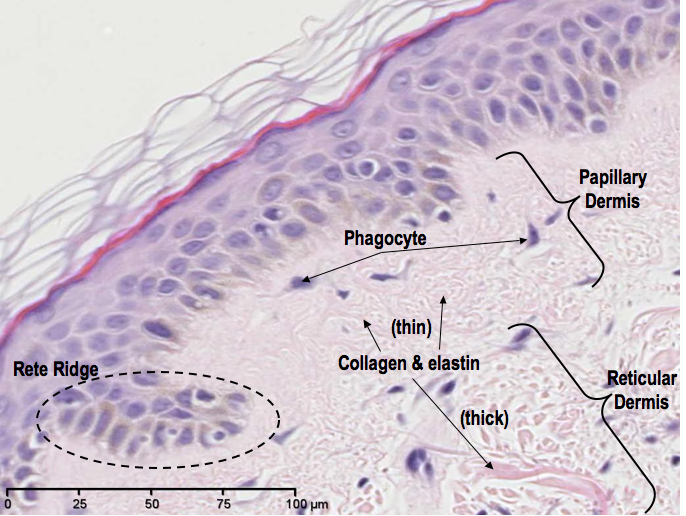 A medium power H&E showing two co-existing behaviours of malignant melanocytes in SSMM: 1) migrating singularly upward towards the skin surface (pagetoid spread), and 2) forming “nests”, which in this case also show an expansion that could result in nests bridging together (circled). 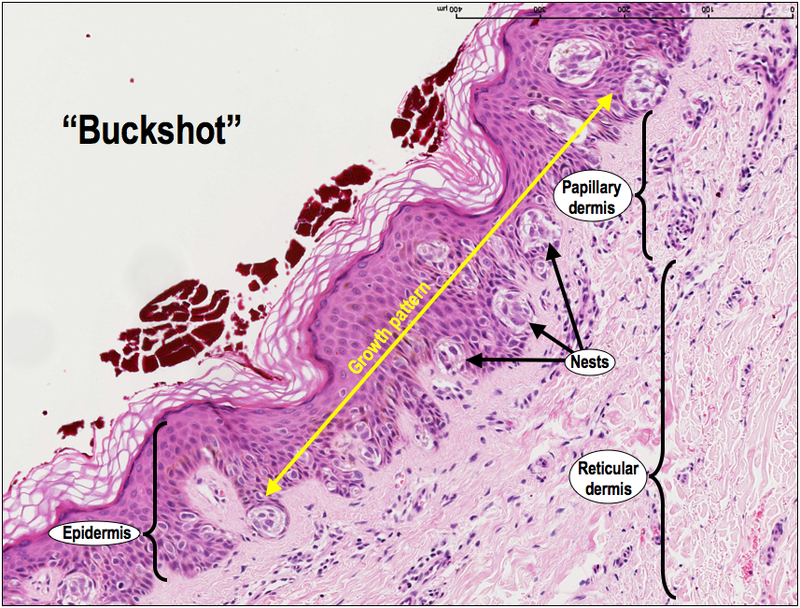 The pagetoid spread of malignant melanocytes is commonly described as a “buckshot” pattern, like someone has just fired a shotgun loaded with malignant melanocytes, at the epidermis. 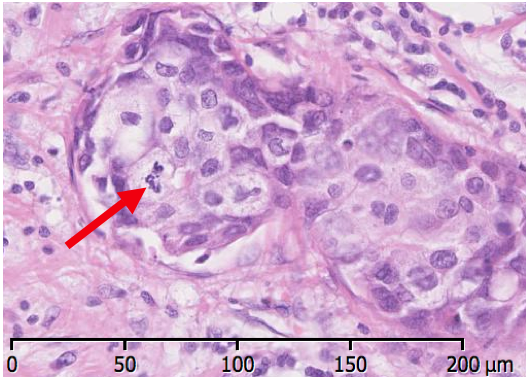 If we zoom out to take a wider look at the extent of the lesion, you can see that the tumour cells are confined to the level of the epidermis. This is called a horizontal tumour growth pattern. 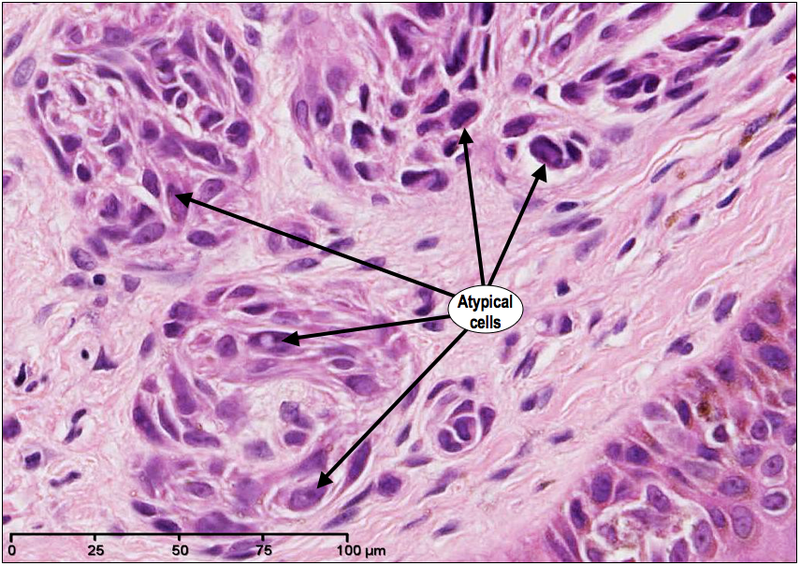 A medium magnification H&E demonstrating nests and pagetoid spread of malignant melanocytes (buckshot) in SSMM, in a horizontal growth pattern only. If the patient’s lesion only demonstrates a horizontal growth pattern, there is a very low risk of the tumour spreading (metastasising), and the prognosis is very good – providing the lesion has been completely excised (and by “very good”, I actually mean “cured”). 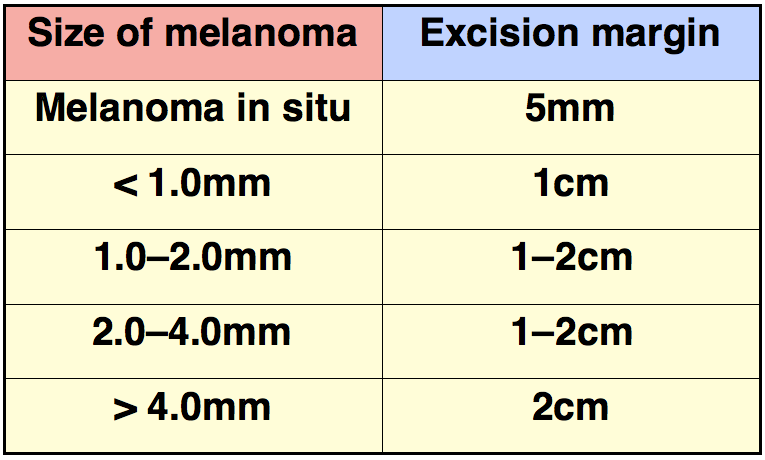 Recommended clear (tumour-free) margin excision according to the size of the malignant melanoma lesion. The more advanced the tumour, however, the more likely the horizontal growth pattern will succumb to an element of vertical growth, meaning that the tumour cells have invaded the deeper skin tissue. This in turn then increases the risk of metastasis. 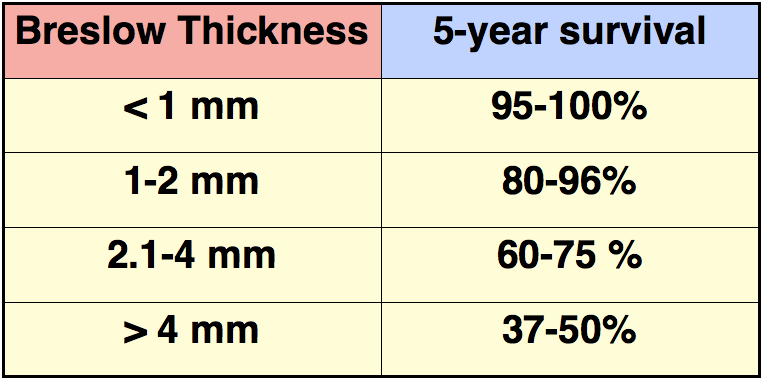 Breslow thickness classification and its relationship with approximate 5-year survival. A medium power H&E showing a suspect area of vertical growth (outlined) in the papillary dermis. 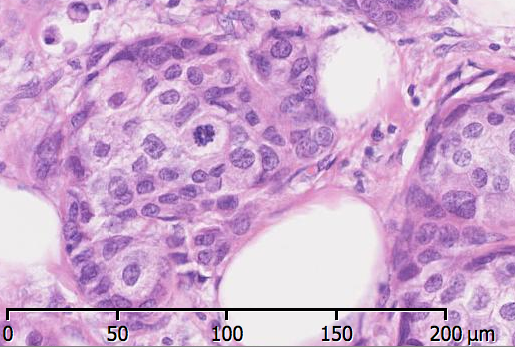 Within that area lies irregular nests to a depth of 0.35mm – an example of measuring Breslow thickness in a malignant melanoma. At this magnification, it is obvious that these nests in the papillary dermis are much larger than the nests seen in the epidermis, which does not confirm but does increase the likelihood that these cells are malignant. A high power H&E showing some atypical, pleomorphic cells. The higher magnification reveals large irregular atypical cells with “pleomorphic” (different from each other) nuclei. But are they benign or malignant? “Atypical” is not synonymous with “malignant”, and so a little more investigation into the nature of such atypical cells may be required if it is not obvious from a H&E. It is possible that the atypical cells seen here are atypical benign melanocytes from a benign neavus (mole). It is crucial to identify them in order to determine whether the patient has an underlying long-standing benign naevus, or an invasive malignant melanoma. The outcome of which is, of course, important in determining the patient’s prognosis. 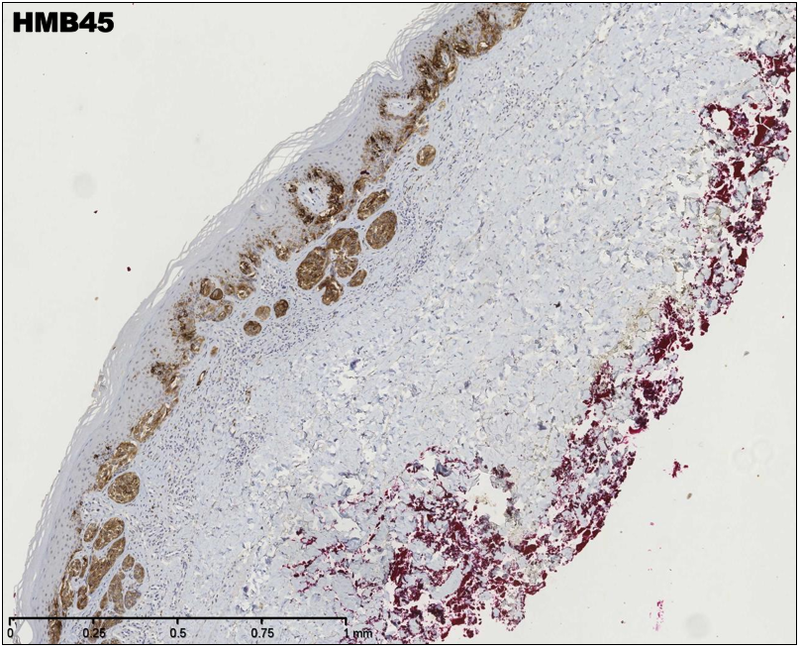 In order to find out, pathologists use a technique called immunohistochemistry (IHC). In brief, IHC uses solutions containing antibodies that bind to specific antigens/markers. The solution is poured onto the tissue section to allow the antibodies to bind to the antigen of interest (if present). These antibodies also bind to a chromogen (colour signal), which stains brown when the antigen/marker is present. 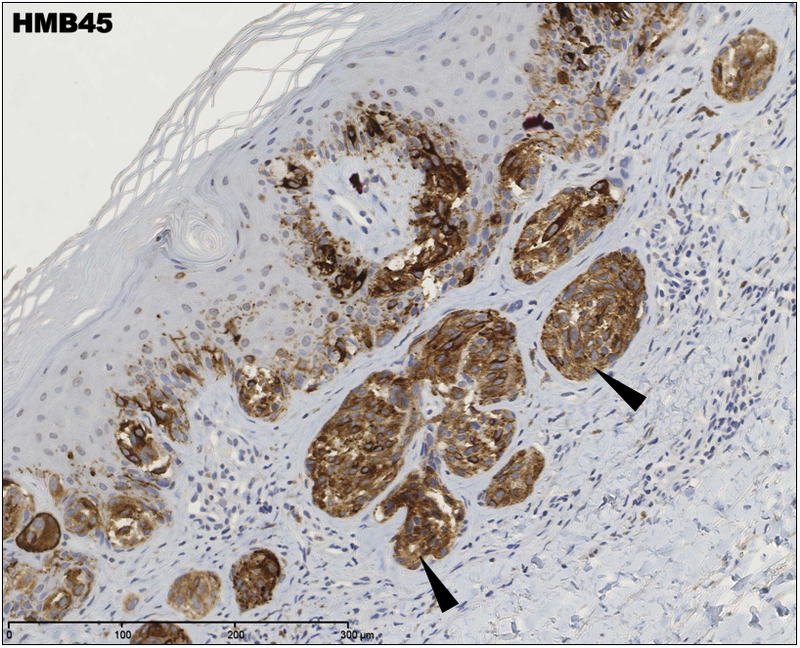 Typically, malignant melanocytes stain very darkly with HMB45. 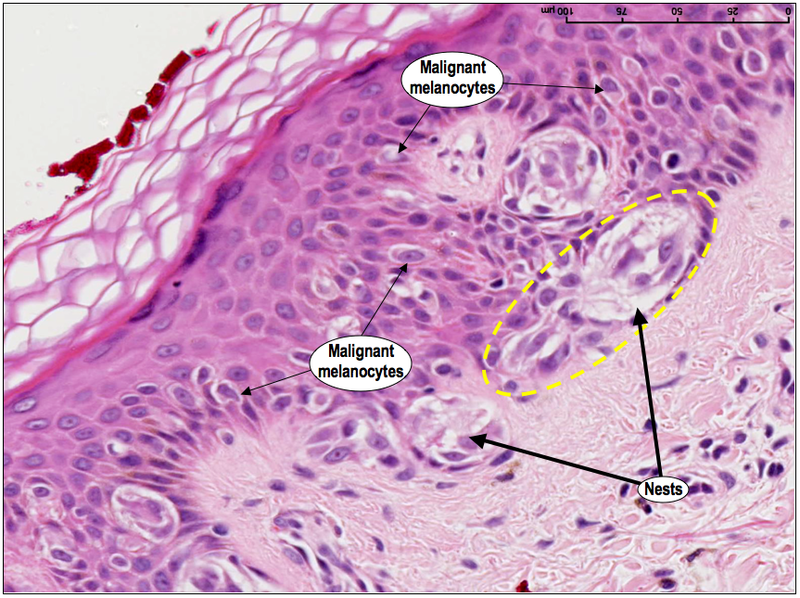 Sometimes, however, some benign melanocytes (naevus cells) can also stain positive, but there is a distinct fading in intensity the deeper in the dermis the cells are located within the nests. If we take a closer look at the staining pattern of the nests in this case, we see that the intensity is strong throughout, indicating that these atypical cells are indeed malignant. This confirms an invasive component to the SSMM, with a Breslow thickness of 0.35 mm. Next, to determine how aggressive (fast growing) the tumour is, a key indicator is to ascertain how quickly the tumour cells are dividing. With a H&E, this can normally be deduced by counting the number of cells that appear to be undergoing mitosis – an indicator of cell division. So, the more mitoses seen, the more cells are dividing (proliferating), and the more aggressive the tumour is. An example of mitosis in a H&E stained tissue section. Can you spot the mitoses? Both of those images were taken from a breast cancer case, but they are good examples of mitoses stained with H&E. So, now we have an idea of what mitoses look like, if we refer back to the high power H&E image of the vertical growth patch, we can see that there are no obvious mitoses. Their absence could suggest a very low proliferation rate, and thus a slow-growing tumour, or it could mean they are just not present in that particular tissue section. So, to measure the cells’ proliferation rate more accurately, we can use IHC again. This time we need to use antibodies that bind to a proliferation marker, the most common of which are MIB1 or Ki67. 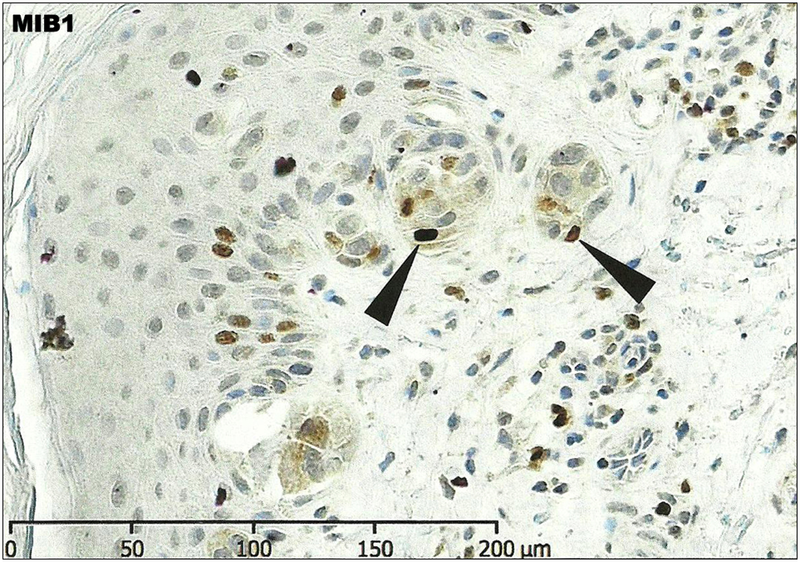 Proliferation marker, MIB1, shows strong nuclear staining in very few malignant melanocytes (arrowheads). As you can see, the majority of malignant melanocytes are negative in their nuclei (staining blue), with only a few epidermal malignant melanocytes and dermal atypical cells showing dark nuclear staining (arrowed). This pattern of staining confirms minimal proliferation and a slow-growing tumour. But don’t worry, this is seen in all normal skin because the basal epithelial cells undergo a normal high level of proliferation. Strong staining basal cells thus act as a good internal control. We now have enough data about this lesion to confirm the exact diagnosis. This lesion is a slow-growing, invasive superficial spreading malignant melanoma with a Breslow thickness of 0.35 mm, without ulceration. At this point, the management of the patient is entirely in the hands of the clinician. They now need to ensure that the excision margins comply with the advised guidelines. As we see from this low power image, despite the large clearance of the deep tissue margin, the melanoma is seen to extend to the outer edges (lateral margins), meaning that a re-excision with a significant clear margin is strongly advised. 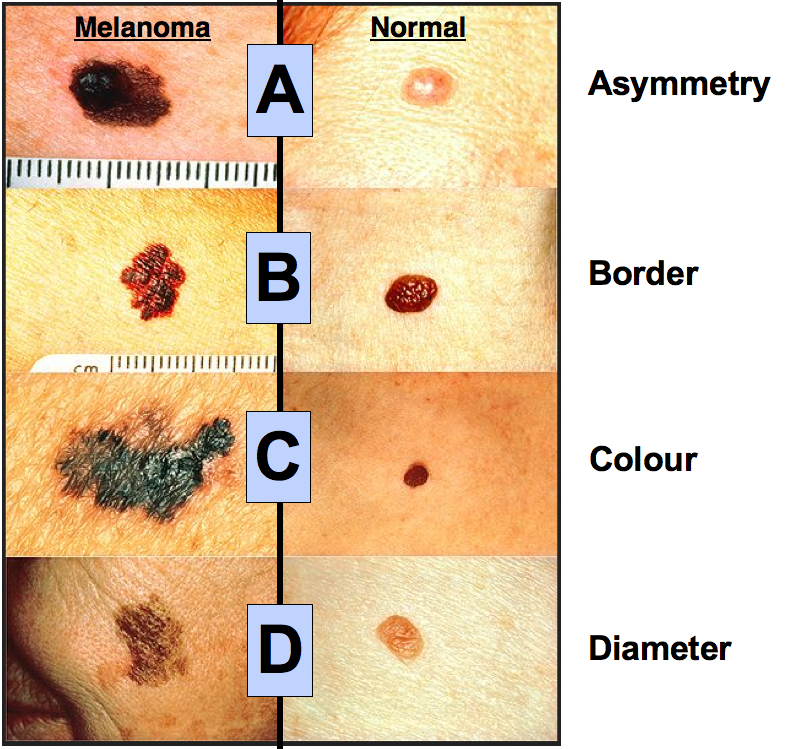 The pathology report diagnosing a melanoma will always detail the type, the pigment, the border of the lesion, the mitotic count (if vertical growth is seen) and presence/absence of nodules, ulceration, microsatellites, or if there is a benign naevus component. A “microsatellite”, by the way, is a nest of tumour cells that is larger than 0.05mm found in either the reticular dermis, subcutis or vessels at a distance greater than 0.5mm beneath and separate from the main tumour. As you may have deduced, the skin cancer case presented in this blogpost shows a Clark Level 2 invasion. Yes, that’s not even it. This melanoma can be further classified using another pathological staging system that is commonly found on pathology reports, and it is known as the Pathological Tumour-Node-Metastasis, or pTNM, classification. The “T” relates to the size and characteristics of the tumour, the “N” relates to the presence or absence of tumour in distant lymph nodes, and “M” denotes presence or absence of metastasis. 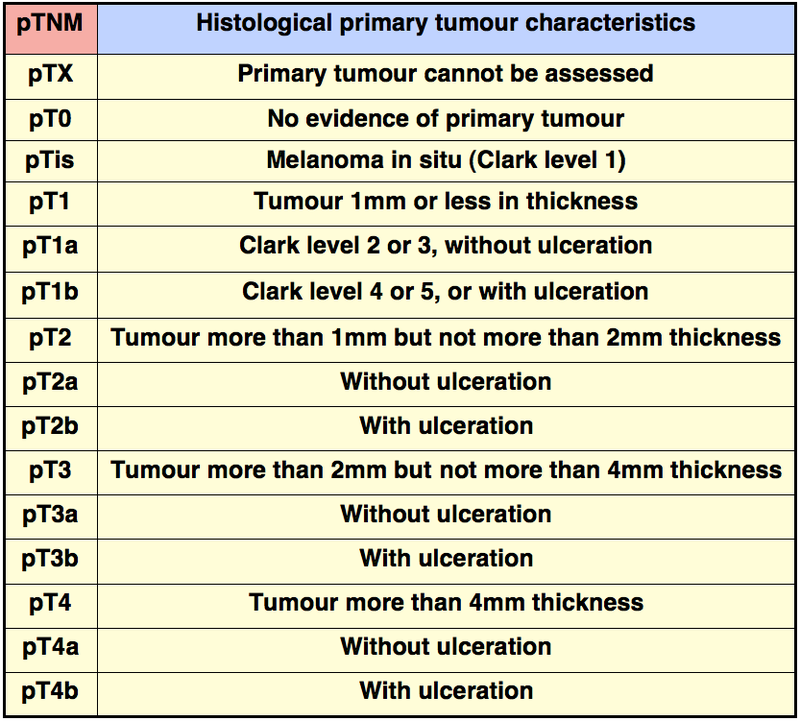 So for the SSMM that we have been looking at, the final addition to the pathology report is its pTNM code, which is pT1a. And that is the diagnosis, complete. So, what are the early signs of malignant melanoma? SSMMs usually arise from benign lesions, in fact about 50% of all types of melanomas do. Normal skin lesions are pretty much always symmetrical, the borders are smooth and even, the pigment is even, and their diameter remains roughly the same all around from the centre of the lesion. If you have noticed any changes to a mole, or you are just wondering what the early signs associated with malignant melanoma change are, you can follow something that is called the ABCDE rule (and be sure to visit your GP if you’re concerned!!). A – Asymmetry: the two halves of the lesion do not match. B – Borders: uneven or ragged. C – Colour: the pigment demonstrates variable shades of black, brown and pink in the same lesion. D – Diameter: variable diameter within the same lesion. The majority of melanomas are larger than 6 mm. E – “Evolving” over time. Why not have a quick check of your moles now? Skin Cancer Statistics [pdf] from Cancer Research UK. All images are Copyright © 2014 Della Thomas, unless otherwise stated. Thank you for providing this essential basic knowledge. I recently had a lesion on my ear diagnosed as a melanoma. I was quite concerned until I read this post. My pathology report was just about identical to the example in this post. The information provided here allowed me to thoroughly understand where I stood. Thank you so much for providing such valuable information. Great. Invaluable information. Thank you. Thank you for your comment, and you’re welcome. Good luck with your future studies! I am a practising pathologist. I really liked your approach and presentation. Keep it up. Thanks !! Thank you so much! Your encouraging comment is much appreciated, I’m so glad you like it. thank you so much! you’re my saviour! I’m an italian med student and i’m studyng for my pathology exam.. we’ll have to make an histological diagnosis, so this material is gold! Thank you, Elisa. I’m so happy to hear you’ve found it useful. All the best in your exam. Thank you for your request. I grant you permission to use my images, I really appreciate you taking the time to ask. Hi Della, I have a very specific question about 2 differing pathological reports describing my husband’s primary malignant melanoma tumor. It turns out pathologists don’t confer directly with patients. Neither the dermatologist nor the surgical pathologist can answer my questions. My questions aren’t related to prognosis or treatment. They are specific to the language and protocol used by histopathologists. Would it be possible to email you my questions (with accompanying path reports)? I would very happily pay you for your time at $100.00 per hour. I can PayPal you funds. I understand if this is not possible. Also, this post was very educational. Your slides were by far the most informative of any of the 100’s I’ve looked at over the last month. Thank you. I’m sorry to hear about your husband’s diagnosis. If there is a technical question I can help you with, I’d be more than happy to help. I don’t offered medical advice, but your request does not seem to be of that nature. I do not wish to accept a fee, but thank you for the offer, that is very kind of you. If you click the contact button on my website, your message will come straight through to my email inbox. If you have any trouble finding that route, please let me know.